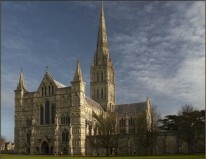 Salisbury Cathedral is both a living church and the finest 13th Century Cathedral in Britain. Built in just 38 years, between 1220 and 1258, it situated within an eighty-acre Close and surrounded by lawns. Just a few miles to the north is Old Sarum, site of the original Cathedral. The Cathedral was constructed to inspire and reflect the glory of God in stone and glass its soaring spire is the tallest in the country. Even today it provides an awe-inspiring setting for spectacular events, yet also a place for quiet prayer and reflection. The Cathedral has a strong visual art tradition, exploring spiritual ideas through the senses. Salisbury Cathedral is a magnificent example of Early English Gothic architecture and sits within the largest and best preserved medieval Close in Britain, amidst picturesque historic buildings and ancient stone walls. The main body of the Cathedral was consecrated in 1258 with the Cloisters, Chapter House and West Front all completed by 1266. The spire (the tallest in Britain at 123m/404ft), was added a generation later between 1310 and 1330. Explore 800 years of history on a free tour with one of our volunteer guides or at your own pace with a self-guiding leaflet. Take an exclusive Tower Tour and climb 332 steps up to the foot of Britain’s tallest spire, pausing to gaze the full length of the Cathedral from just below the West window. Witness our original 1215 Magna Carta, one of only four in the World, and explore its legacy in the accompanying exhibition. Discover the world’s oldest working mechanical clock (AD 1386) and learn about time and the Cathedral. Pause for reflection by our magnificent William Pye font, designed as a pool of stillness in the heart of the Nave. Enjoy afternoon tea in The Refectory restaurant or newly opened The Bell Tower Tea Rooms overlooking the Cathedral lawn. Join us for Evensong sung by cathedral choristers in a tradition of worship that goes back over 800 years. Wonder at the largest and earliest complete set of choir stalls with intricate carvings and a magnificent selection of misericords in the Cathedral Quire. Stroll around the Cathedral Cloisters to explore the Cathedral’s beautiful medieval Chapter House with its unique 13th century stone frieze of bible stories from the Old Testament. Stand before the stunning Prisoner of Conscience window made from Chartres blue glass by Gabriel Loire in 1980 and explore the rest of the Cathedral’s stained glass.